This book was written to address the need for timely, thorough, practical, and defensible job analysis for HR managers. 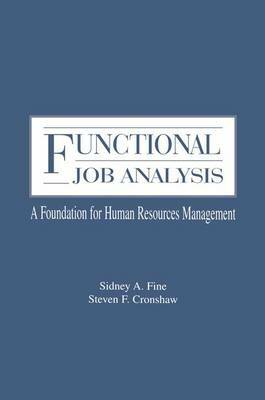 Under continuing development over the past 50 years, Functional Job Analysis (FJA) is acknowledged by major texts in HR and industrial/organizational psychology as one of the premier methods of job analysis used by leading-edge organizations in the private and public sectors. It is unique among job analysis methods in having its own in-depth theoretical grounding within a systems framework. In addition to providing a methodology for analyzing jobs, it offers a rich model and vocabulary for communicating about the competencies (skills) contributing to work success and about the design of the work organization through which those competencies are expressed. FJA is the right theory and methodology for future work in an increasingly competitive global economy. This book is the authoritative source describing how FJA can encourage and support an ongoing dialogue between workers and management as they jointly pursue total quality, worker growth, and organization performance. It is a flexible tool, fully recognizing the rapid changes impacting today's organizations. It is a comprehensive tool, leading to an in-depth understanding of work, its results, and its improvement in a unique organization context. It is a humane tool, viewing workers in light of their full potential and capacity for positive growth. With FJA, workers and managers can work more constructively together in a wholesome and productive work relationship.